BOSTON (AP) Josh McDaniels sent ripples throughout the NFL with his decision to pull out of an agreement to become the Indianapolis Colts’ head coach. He has yet to speak publicly about what factored into the 11th hour about-face. But McDaniels’ return as New England’s offensive coordinator keeps a possible successor for Patriots coach Bill Belichick in house. Belichick gave no indication after the Super Bowl loss to Philadelphia on Sunday night that he plans to exit in 2018. And just last month he said that it was ”absolutely” his intention to be back for his 19th season with the Patriots. But at age 65 he’s also the second-oldest coach in the NFL, behind only Seattle’s Pete Carroll at 66. McDaniels has been one of the hottest names in coaching searches every offseason over the past three years. It’s unclear how McDaniels’ decision will affect him regarding future opportunities with other NFL teams, a gamble should he never get the opportunity to lead the Patriots. Colts general manager Chris Ballard said Wednesday that the assistants that McDaniels had already hired to be on his staff would have their contracts honored. If McDaniels ever leaves New England again, he will certainly have some repairs to make to his image around the league. Responding to a suggestion that comfort with the Patriots might have played a role in McDaniels’ decision, former coach and current NBC football analyst Tony Dungy said in a tweet Wednesday that ”there is no excuse big enough to justify this,” adding it was indefensible to leave the assistant coaches he’s hired in limbo. LaMonte didn’t return a message seeking comment. LaMonte represents several coaches and executives around the NFL, including Ballard. McDaniels is one of Belichick’s most-tenured assistants, having served under him a combined of 15 years (nine as offensive coordinator) over two different stints, beginning in 2001. It’s a run that allowed him to be a part of all five of New England’s Super Bowl wins. The only break in his Patriots’ timeline came from 2009 to 2011, when he served as the Denver Broncos coach for two seasons, followed by a stop in St. Louis as the Rams offensive coordinator in 2011. He returned to New England in 2012. During Super Bowl week, McDaniels spoke about the support he has in New England. He said it was the biggest takeaway from his failed experience in Denver. The Patriots have rarely let people with significant institutional knowledge walk out the door since Belichick took over in 2000. And It would hardly be ideal timing for the Patriots to change offensive coordinators on Brady, who will also turn 41 in August. Despite New England’s Super Bowl loss to the Eagles, McDaniels was the architect of another typical Patriots offensive showcase, as New England gained 613 yards. 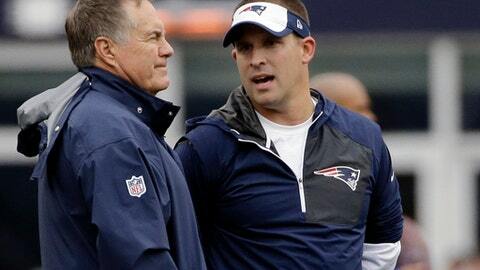 McDaniels and Brady did have a heated moment on the sideline during win over Buffalo this past season. But Brady publicly apologized to McDaniels after video of their verbal skirmish went viral.